ALL services and events meet at 300 Bloor Street West. Please check the schedule below as we DO NOT meet every week. All City Shul Shabbat Services are free and all are welcome, whether you are a member or not. Visitors, guests, newcomers, those just visiting Toronto on business or vacation, those just curious, shul-shoppers and shul-hoppers and regulars all can join us at any and all of our Shabbat services, kiddush, and Friday night services and dinners. We never have "private" services or a "private" kiddush of "invited-only" folks - whether or not there is a Bar or Bat Mitzvah, babynaming, aufruf, or any other simcha. What about children? Children are always welcome at our Saturday. If there's a time we need quiet-like the mourner's Kaddish, for example, or during the dvar Torah-we will ask them to wait outside for a moment. Family Friday nights are totally geared for children. Older children who can sit through an hour service without activities or childcare are welcome at Adult Kabbalat Shabbat. On Saturdays we always-even on Bar/Bat Mitzvah days-have Club Katan (ages 7-11, crafts, music, discussion, and Judaic-themed games) plus the "Prayground"-an area in the sanctuary where parents can sit with playing toddlers-for little ones. Children begin with us in the "main" service up until after the silent Amidah, then are welcome to stay or go off to their various activities. At the end of the service the children are invited to come up for a blessing, and to get a treat if they haven't already gathered the thrown candies at our Bar/Bat Mitzvah child! Throughout the year, about once a month, we add a Saturday Family "Mishpacha" service filled with music and family-friendly activities for all ages, Tot Shabbat, a 60 minute programme for ages 1-5 that focuses on song, movement, a fun and do-able craft, and Jewish time together with a parent; and Bar/Bat Mitzvah Club, a special programme with our shins for grades 6 and 7. Dates fro these special programmes appear under "service dates." New to our synagogue? Just checking us out? Haven't been to synagogue in who-knows-how-long? We will provide a "shul buddy" to sit with you and help you feel welcome and at home at our Shabbat services! Email the Rabbi to be matched up. (Please note we need 2-3 days lead notice for a buddy-match). May 25 - Rabbi Elyse Goldstein and Yona Lunsky. We celebrate the Bat Mitzvah of Yasmin Katz. 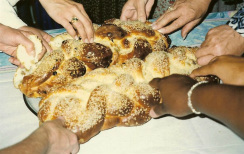 Adult Kabbalat Shabbat Services at 6:30 pm and are always followed by dinner. There is no childcare or children's programming but children who can enjoy a service without that are welcome! April 26 - Join us after services for a kosher-for-Passover fish dinner (w/ vegan option). Click here to reserve. Summer Shabbat morning services are held bi-weekly in July and August. Please note the dates below, we welcome you "warmly"! All summer services followed by kiddush as during the year. We welcome you to co-sponsor our Saturday morning kiddush in honour of a simcha or special birthday/ anniversary, in memory of a loved one, in commemoration of a yartzeit, or just because! Sponsorships are tax receipted. Just choose your date (non Bar/ Bat Mitzvah) and email Rivka. SATURDAY MORNING SERVICES are geared for all ages: Our Shabbat morning services include Torah reading and dvar Torah. We offer Club Katan every week for grades SK-4 with snack, story, crafts, and more. SHABBAT-TOT with Bryna and friends (YOU!). Join us for songs, snack, story and crafts. A once a month 60 minute programme for parent and tot ages 1-5. BAR/BAT MITZVAH CLUB for grades 6 and 7 only, is a special 45 minute programme during Shabbat morning service, with the shins, that will include snack, dynamic conversation on current topics, and a monthly prayer focus. No pre-registration needed! KABBALAT SHABBAT Friday night once a month services are geared to adults and children who don't need childcare. There are no children's activities or childcare at these services but children are welcome to experience this quieter musical service. Followed by dinner. FRIDAY NIGHT FAMILY SERVICE is a story and songs service geared to people with younger children, followed by dinner.